Maddie Simon poured in 19 points, Hannah Whitish added 18 and Taylor Kissinger contributed 12 points, including Nebraska’s final four points at the free throw line, as the young Huskers battled their way to a 74-65 women’s basketball win over Iowa on Tuesday night at Pinnacle Bank Arena. The victory was Nebraska’s first over a top-25 foe under second-year coach Amy Williams and it snapped Iowa’s five-game winning streak in the all-time series with the Huskers. It also ended Nebraska’s three-game losing streak at home, while moving Nebraska to 13-6 overall and 4-2 in the Big Ten. The Huskers moved within one game in the loss column of the top of the Big Ten standings, after No. 19 Michigan upset at No. 8 Ohio State earlier Tuesday evening. The Buckeyes were 5-0 in the league before the loss to the Wolverines. Iowa slipped to 15-4 overall and 3-3 in the Big Ten. The Huskers will see the Hawkeyes again in 12 days (Jan. 28) in Iowa City. Like so many of Nebraska’s victories this season, the Huskers did not make it easy on themselves. The Big Red went just 17-for-35 (.486) at the free throw line, including 4-for-10 in the final 49 seconds. Nebraska was also outrebounded 53-40 by the Hawkeyes, including 18 boards and 29 points from Iowa junior center Megan Gustafson. The Huskers made up for their mistakes by outscoring the Hawkeyes 27-0 from three-point range, as Simon (3-4) and Whitish (2-4) combined to go 5-for-8 from beyond the arc. As a team, Nebraska hit 9-of-25 three-pointers (.360) on the night while Iowa went 0-for-7. It marked the first time under Coach Williams that the Huskers had shut out a team from beyond the arc. It was the first time the Hawkeyes had been held to fewer than three made threes in a game this season. In fact, in the first 39 minutes, Iowa only attempted three threes and one of them was blocked. In the final minutes, the Hawkeyes were 0-for-4 from long range and not close to making any of them. The last time Nebraska held an opponent without a three-pointer came at Rutgers on Feb. 5, 2015, a span of 88 games. Nebraska only turned the ball over eight times – a Big Ten season best – while forcing 15 turnovers by the Hawkeyes. The Huskers scored 23 points off Iowa’s turnovers, while holding Iowa to just 12 points in that category. For the game, Nebraska hit just 38.1 percent (24-63) of its shots from the field against an Iowa team that is among the Big Ten leaders in field goal percentage defense. Iowa hit 39.1 percent (27-69), including 13-of-23 from the field for Gustafson and just 14-of-46 (.304) for the rest of the Hawkeyes. The Huskers also forced a season-high 26 fouls on Iowa. Nebraska used a big second quarter to take a 37-28 lead into the locker room at halftime against the No. 20 Hawkeyes. The Huskers trailed 8-1 to open the game before rallying to tie the score at 14 at the end of the period. The Huskers tied the Hawkeyes in the first quarter despite hitting just 4-of-15 shots and just 1-of-6 three-pointers in the period. The Huskers heated up in the second quarter. After the two teams exchanged the lead six times in the first five minutes, Emily Wood buried a three-pointer to tie the game at 24, before Whitish hit another three 46 seconds later to shoot Nebraska to a 27-24 lead. A layup from Whitish gave Nebraska a 29-24 edge to cap an 8-0 run before Amanda Ollinger stopped the run with a putback for the Hawkeyes. Ollinger finished with 12 points and eight rebounds off the bench for the Hawkeyes. But a steal and a layup by Janay Morton pushed the lead back to five before back-to-back threes for Kissinger and Morton around a layup for Gustafson gave Nebraska a 37-28 lead. For the quarter, the Huskers went 5-for-9 from three-point range. In the half Nebraska hit just 37.1 percent (13-35) of its first-half shots, but hit 6-of-15 threes (.400). The Huskers also outscored the Hawkeyes, 5-4 at the free throw line in the half. The Huskers quickly pushed the lead to 15 points at 47-32 early in the third quarter before Iowa rallied with a 10-0 run to trim the margin to five at 47-42 with 2:32 left. Simon scored Nebraska’s final six points and Nebraska maintained a 53-47 lead at the end of three quarters. 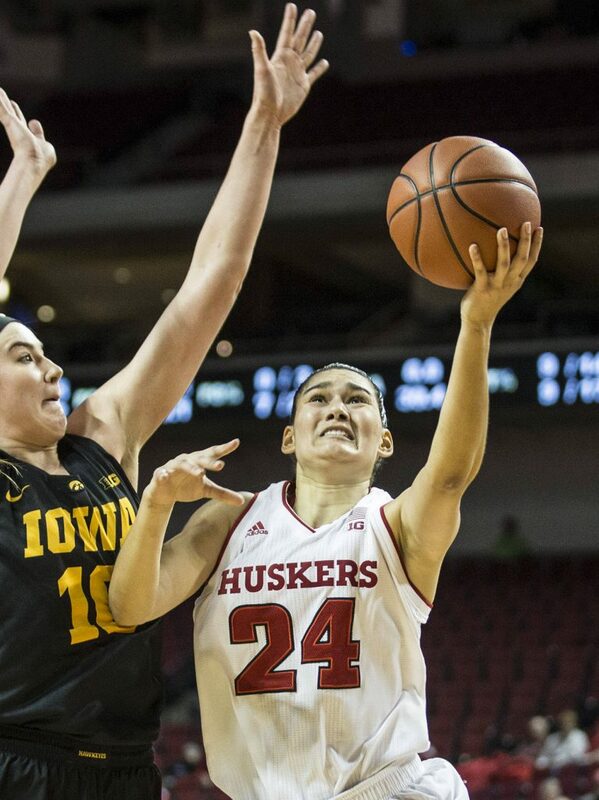 In the fourth quarter, Nebraska pushed the lead back to double digits at 64-53 after a pair of threes by Simon around a pair of free threes by Nicea Eliely, who finished with six points on the night. Iowa got the lead back to four points at 67-63 with just under two minutes before Jasmine Cincore scored her only points of the night on a run-out layup. Cincore finished at the rim and was fouled by Gustafson, who committed her fifth foul with 1:21 left. Cincore completed the three-point play to give Nebraska a 70-63 edge. The Hawkeyes got a bucket from Hannah Stewart, who finished with six points, with one minute left, but the Huskers closed the game with outstanding defense and four free throws from Kissinger in the final 27.2 seconds. The Huskers return to Big Ten road action this weekend when they travel to Piscataway, N.J., to take on No. 25 Rutgers. Tip-off between the Big Red and the Scarlet Knights at The RAC is set for Sunday at 5 p.m. (CT).